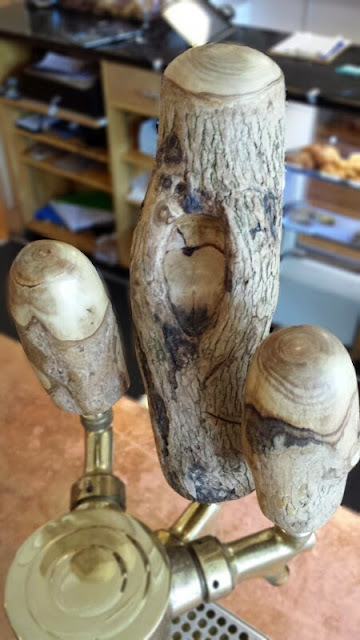 Keep it local Camberville, MA: barismo's founder, Jaime van Schyndel gives a run down on some cool new tap handles at dwelltime. Coldbrew on tap is the new big thing right now. Cafes, offices, and restaurants are picking this as a new option for quick serve coffee. There are pre-designed 'javarator' setups you can buy and even a reddit section dedicated to the kegging of iced coffee setups. This is the next big thing in coffee! While visiting El Bosque de Parramos in Guatemala this spring, I picked up a section of a coffee tree stump from a plot of the farm that had older plantings. This was one of 5 branches coming off the main stump and was still alive. Avelino himself cut the stump off and chose this particular piece of wood. I brought the wood back and left it with our friends and Somerville neighbors at DGF. After some curing and resting time, the wood was cut into three sections, sanded and prepped as tap handles for a kegged coldbrew setup. One of the cool aspects of this old stump is that is was right along the pathway. It has several scars along it's backside that came over the years. Over time, different farm workers would sit roadside and have their lunch. They would invariably leave their machete in the closest stump, to which this little tree was the victim a few times. Kind of cool to think about how over the years, the scars tell a story. Coffee wood grows fast and is typically not good quality. The older varietals that are less dwarfed can get to 20ft tall and this is the type of heirloom bourbon we ended up sawing off to make our handles. This particular stump may have had 20 years on this branch to get to this size. It's color is a bit like poplar but it has a slight tint of green to the bark and wood. Needless to say, I am excited to see how it ages and colors with time. 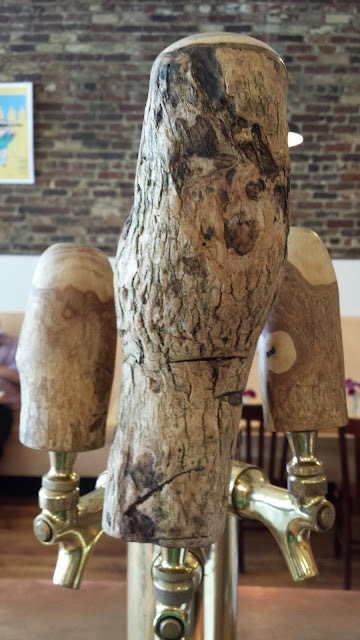 While we can't guarantee coffee wood tap handles for your setup, we can help you with a no fuss install and consistent quality product if you are in the Boston/Cambridge area. If you are interested in serving coldbrew on tap locally or having this in your office, let us know. We have been refining the process and have a separate division dedicated to expanding this. We already have offices and clients across the spectrum setup for coldbrew coffee and tea on tap but are looking for some exciting new places to get this concept into while it's still hot outside. After some hurdles, we are now roasting in our new space! 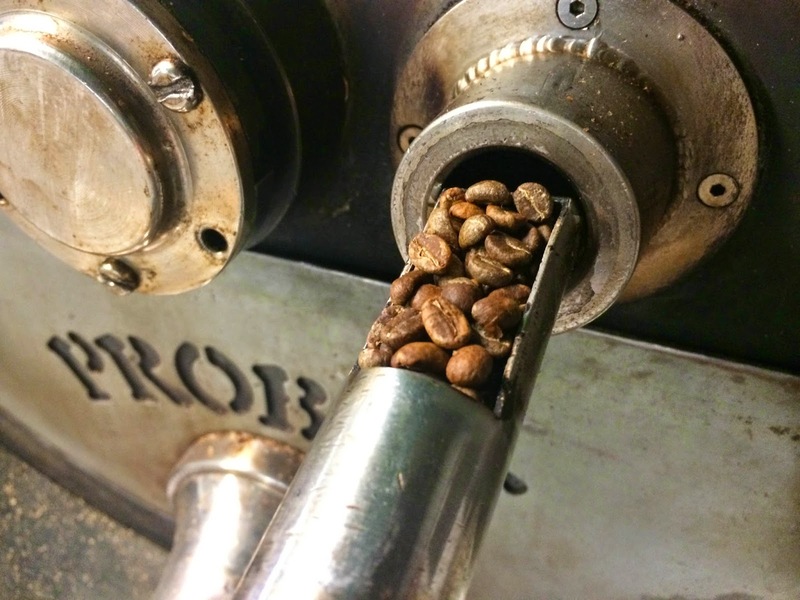 Our first full day of production roasting was on Monday. While we weren't planning on a few of the hurdles that set back the move until the last few days of June, the silver lining was that the majority of our 2014 crop coffees are just getting to port in the next 2 weeks, so we had to move just a quarter of the amount of coffee from 171 Mass Ave, Arlington to our new home at 14 Tyler Street, Somerville. We took last Thursday to move over, and brought over some extra hands to help with moving bags of coffee. Among the many positives to our new roastery is the addition of a loading dock; many of our long time customers have seen us in the past having pallets of coffee dropped off on the sidewalk, then carrying them one at a time through the roastery and downstairs to our basement storage. Pallet jacks and forklifts are lightening the load quite a bit. Along with the change in location, we've switched the actual roaster we use. Our trusty pair of 4 kilo roasters has served us well, but we had reached near maximum roasting capacity. Late last year we purchased a 12 kilo Probat coffee roaster and have been refurbishing it inside & out. We've been happy with the results so far, and you should expect a positive difference in our coffees going forward. We're spending most of this week and next working out some of the logistics of our wholesale operation here. By the middle of the month we'll have updates with events & classes at the new space. While it's not a retail store or coffeebar, there'll be plenty of opportunity through the rest of the summer to get to see our new home. We've released some new coffees over the past few weeks from this years crop of coffees out of Kenya & Ethiopia; in addition to Doppleganger (on our last blog update), we've released Homunculus (a 50/50 blend of coffees from two different mills in the same region of Ethiopia), and Kochere Grade 1 (one of the components of Homunculus). We have a second wave of coffees from Ethiopia & Kenya already lined up for later this summer. We're expecting the boat carrying our coffees from Costa Rica to arrive at port in New Jersey on July 8th. 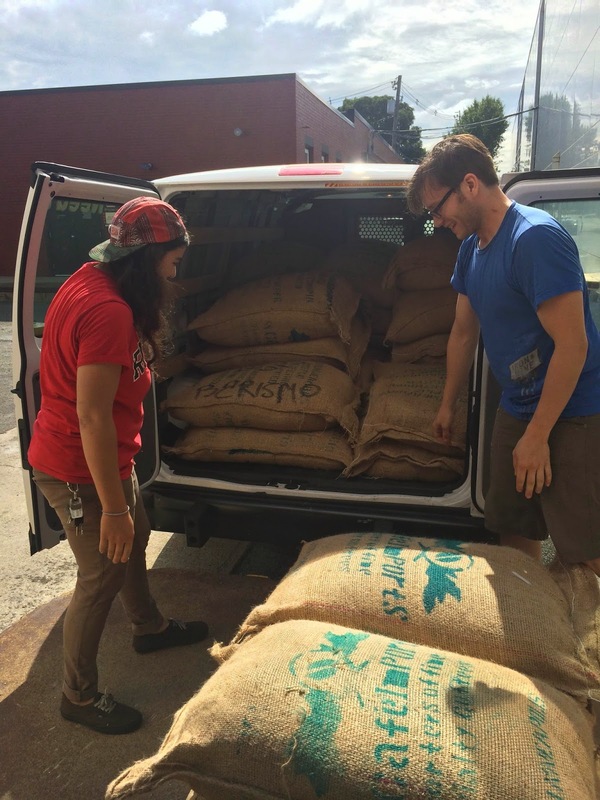 It should take another week upon arrival to clear customs, then we'll be able to bring these coffees -- Jardin de Aromas & Bandera de Dota -- up to Somerville! Confirming more good news & arrival details from Guatemala today; we'll have a further update for you next week!